This is a piano sheet. The second line is in bass clef. The blue one and the green one are same. How should I play this two? Should I pick up my left hand and play the blue one? I also notice the C-flat later on in the bar, which is enharmonically equivalent to a B natural. Since it is preceded immediately by a B, it is almost certain that there is at least a B-flat in the key signature. But as the response above says, it would be awkward if the E in the left hand was not a flat, because it would otherwise not be technically playable. So I am pretty certain that there should be an E-flat in the key signature as well. Also accounting for the double bar which indicates this bar is the beginning of a section or theme, I think the key would be either B-flat major or E-flat major, but it could also be a modulation to D-flat minor (which has a F-flat), but as before, I cannot guarantee a firm response until you tell or show us what the key signature is. I suspect it's in 5 flats. Then it all makes perfect sense. Not the answer you're looking for? Browse other questions tagged piano sheet-music or ask your own question. 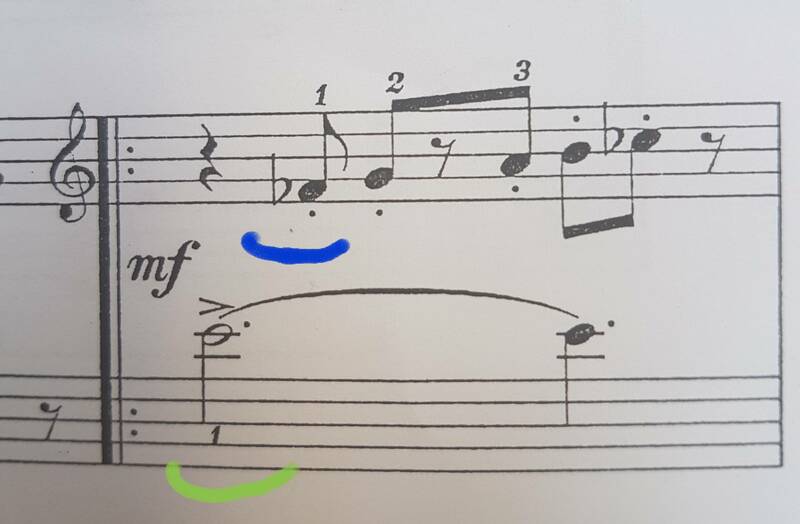 Is there a special way to notate a repeat for the right (treble) hand but not the left (bass) hand? Right hand in top stave? Same note to be played with both hands? Left and right hand playing same note on piano?